Computer software that creates a statistical model of even indecipherable languages is being used in an attempt to better understand texts the meaning of which have been lost. This fragment of text from the Indus Valley between 2600 and 1900 BC is part of more than 5,000 seals, tablets and amulets discovered by archaeologists. Experts even disagree on whether or not the markings, called the Harappan script, even constitute a language. National pride is at stake; some scholars have declared that the script only provides rudimentary pictograms and that the Indus Valley people were functionally illiterate. American and Indian computer scientists entered the symbols and are running a statistical analysis. "The computer program operates on sequences of symbols, so it can be used to learn a statistical model of any set of unknown or known texts," says Rajesh Rao, University of Washington professor of computer science and co-author of the paper published in the Proceedings of the National Academy of Science. "In fact, such statistical models have been used to analyze a wide variety of sequences ranging from DNA and speech to economic data." At present, researchers like Rao are simply trying to determine if the markings are really a language. Our results appear to favor the hypothesis that the Indus script represents a linguistic writing system. Our Markov analysis of sign sequences, although restricted to pairwise statistics, makes it clear that the signs do not occur in a random manner within inscriptions but appear to follow certain rules: (i) some signs have a high probability of occurring at the beginning of inscriptions whereas others almost never occur at the beginning; and (ii) for any particular sign, there are signs that have a high probability of occurring after that sign and other signs that have negligible probability of occurring after the same sign. Furthermore, signs appear to fall into functional classes in terms of their position within an Indus text, where a particular sign can be replaced by another sign in its equivalence class. Such rich syntactic structure is hard to reconcile with a nonlinguistic system. Additionally, our finding that the script may have been versatile enough to represent different subject matter in West Asia argues against the claim that the script merely represents religious or political symbols. Many experts, however, remain pessimistic, believing that these texts may never be fully translated without some sort of Rosetta Stone. The Rosetta Stone is a famous ancient Egyptian stone with carved text in Demotic, hieroglyphic and classical Greek; it was the key to translating many important Egyptian texts in the mid-1800's. 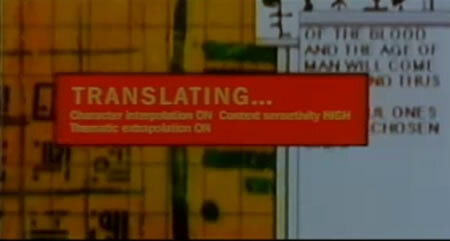 This idea of cracking ancient languages was popularized in the 1998 film Blade, based on the 1970's Marvel Comics character. In the movie, Deacon Frost, an ambitious young vampire, believes that the key to ultimate power for himself lies in the untranslatable Book of Erebus, a set of long parchments. Deacon Frost is the modern sort of vampire, who largely disdains the conservative, ancient ways; he uses computers to crack the Book of Erebus to gain its power for himself. 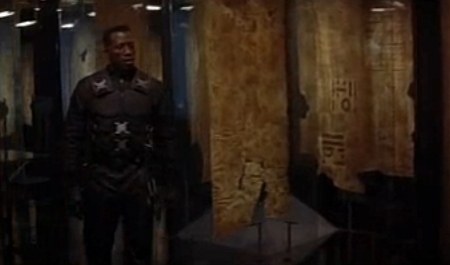 Blade arrives at the opportune moment, with his own slashing analysis. 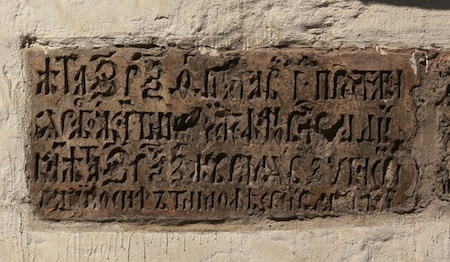 Perhaps indecipherable ancient texts are better left untranslated. Read more about the Indus Valley computer analysis story at ABC Science and Time; read the original paper A Markov model of the Indus script (pdf). Thanks to Moira for suggesting the topic in association with Blade.